As I noted when I reviewed Social for the iPad, Facebook makes one of the most popular iPhone apps in the App Store, but to date the company hasn’t released a native iPad app. That’s created an opportunity for third-party developers to attempt to fill that iPad-sized Facebook void. Those developers aren’t just competing with each other; they’re competing with Mobile Safari, too. I tried out Facely HD, a $3 app from G-Whizz Apps. The app, which previously was available under the Facebook Touch HD moniker, essentially provides a customized, skinned view of Facebook’s touch-based mobile site. And the end result is merely OK.
That touch-based mobile version of Facebook is pretty good to begin with, and Facely HD attempts to build on it. The app lets you tweak its colors and font. By default, it’s an elegant red, Helvetica mix, but you can go the hot pink, Zapfino route if you’re so inclined. Best Face Forward: Facely HD does some things that the mobile version of Facebook can’t do. It offers push alerts, you can upload photos and like comments, and you can modify the look of Facebook. Facely HD handles a lot of typical Facebook navigation and usage well. Pages load fairly quickly—though loading screens appear between taps, they vanish after a second or two. 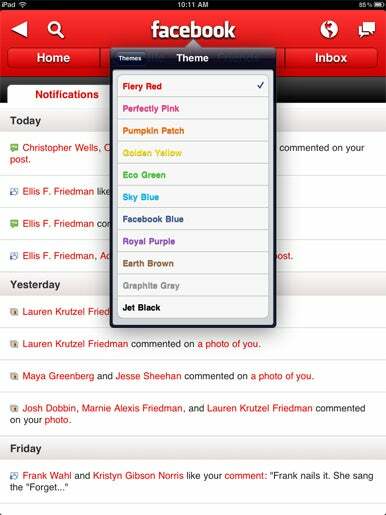 In an improvement over Facebook's own native iPhone app, Facely lets you like comments, in addition to posts. Commenting, unfortunately, gets a bit wonky: After I tap one in, the comment thread disappears (and the number of comments indicated for the post doesn't increment). If I click to expand the comments again, mine is there—it truly has saved—but the experience of posting comments always feels a bit disconcerting, as if they're vanishing into the ether. There are a few reasons, to be sure. Facely can incorporate push alerts for Facebook notifications, which Safari can't do. Facely offers the aforementioned colorful theming options, if that floats your iOS boat. And Facely lets you upload photos, which you can't do via Safari, either. Frankly, I too frequently miss features from the main site when I use the touch-based one—like the ability to share another person’s posts. I find that the main Facebook site works great on my iPad; like Social before it, Facely HD provides few compelling reasons to switch. That said, if you don't enjoy the Facebook experience in Safari—since it's certainly harder to delete posts, and some navigation elements don't work quite right—Facely HD is worth a shot. Due to an editing error, this review was originally published with the wrong rating. The article was updated at 6:48 a.m. PT to correct the rating.